Sold for 21.400.000 SEK at Uppsala Auktionskammares evening sale ”The Neuman Collection”, 7 Dec 2016. 1003. Pablo Picasso (1881‑1973). ”Fillette au béret”. Signed Picasso and on the reverse dated 12.12.64 and numbered III. Oil on canvas, 65 x 54 cm. During the 1960’s, Picasso painted many series of portraits. Most of the paintings from this period in the artist’s life portrayed his wife Jacqueline, by far his most frequent subject, or young boys or men dressed in striped sweaters and with black speckled hair and sometimes beards. Portraits of young girls from the mid 1960’s are rare but Fillette au béret has many similar attributes to Picasso’s paintings of young boys dating from the same time. The figures are brought to life by a series of lines, dots and dashes and the viewer’s perception of the faces is being challenged by the formation of the nose and the blurred yet strong brushstrokes. During this time he produced several paintings of children in his surroundings. Fillette au béret is included in a series of three paintings, which were all painted on the same day, 12 December 1964. It is the only portrait of a female out of the three; nevertheless Picasso painted them all in the same immediate and spontaneous way, which characterises many of his later works. Above left: Figure 1: Buste d’homme, 1964. © Sotheby’s 2016. © Succession PicassoFigure 1: Buste d’homme, 1964. 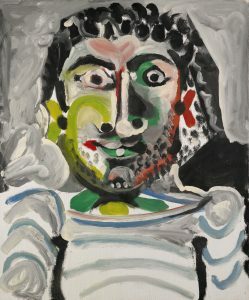 The first painting in the series is the portrait of a man (Figure 1), Buste d’homme (Private Collection), dressed in the characteristic striped top that resembles many of Picasso’s own garments. To improve the sense of masculinity and powerfulness, Picasso painted the older man with strong features and an expressive face. 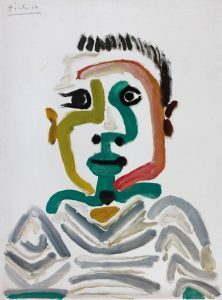 Compared to the portrait of a young boy, which Picasso painted on the same day and numbered II (Figure 2), Buste de jeune garçon (Private Collection), Picasso intensified the impression of a grown man by the use of dark colours for the eyes, hair and beard. When Picasso painted the younger boy and the portrait of the young girl, he used the same colours and delineation to create the impression of childishness. The resemblance between especially Fillette au béret and that of the young boy are striking and shows Picasso’s impressive ability to capture a personality with only a few brushstrokes. Louise D’Argencourt commented on Picassos last works; “The contemplative character of Picasso’s last works – expressed in part in the tranquil poses of his seated figures, the importance given to their heads, and the absence in them of all agitation – is often balanced by a spirited execution that makes use of many painterly effects” (Louise d’Argencourt, Pablo Picasso, Meeting in Montreal, Montreal Museum of Fine Arts, Montreal, 1985, p. 284). The strong colour palette of green, red, black, yellow and blue shown in Fillette au béret evoke a fulfilling yet intensive and powerful time in the artist’s life. 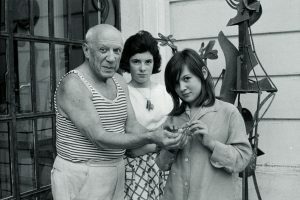 Picasso, Catherine (“Cathy”) Hutin and Paloma. La Californie, Cannes 1960. Given the apparent age of the young girl featured in this painting, it is possible to surmise that it represents Jacqueline Roque’s daughter from her previous marriage with the engineer André Hutin. She was one of a few young girls surrounding Picasso, and appears in the artist’s portraits from this time. Picasso first met Jacqueline at the pottery studio in Vallauris in 1952, where the artist was still living at that time with Françoise Gilot and their two children Claude and Paloma. 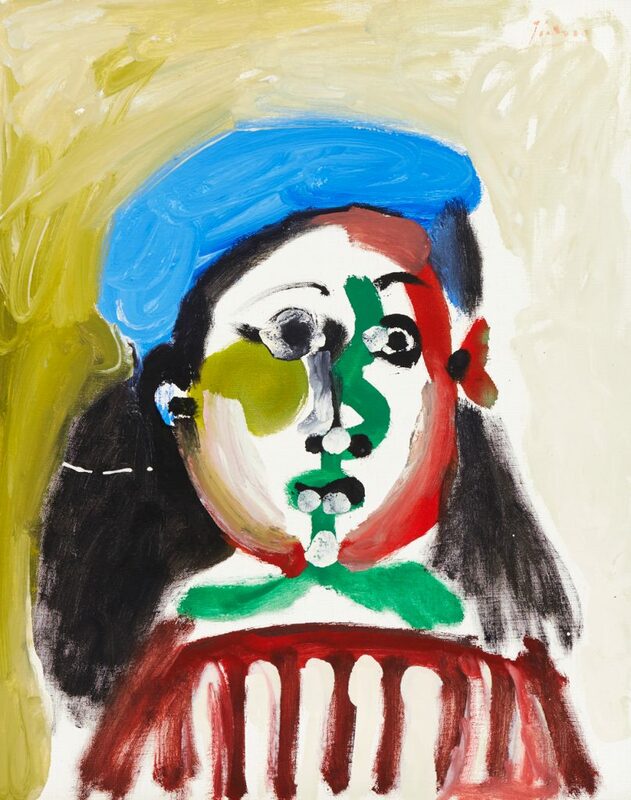 When Picasso painted Fillette au béret in December 1964, Jacqueline’s daughter Catherine was sixteen years old and her mother had by then been married to the artist for three years. When he passed away in 1973, he had very much become a stepfather to the young woman and this expressive painting might reveal the close and loving relationship between the two. 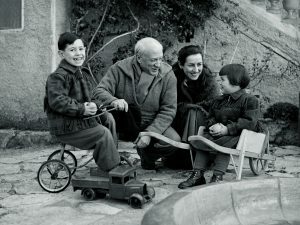 Françoise Gilot and Picasso with their children Claude and Paloma in Vallauris 1953. The same year that he painted Fillette au béret, Françoise Gilot, his lover between 1944 and 1953, published her story about their relationship in her book, Life with Picasso. Picasso made a great effort trying to prevent the story from becoming public but when it did, his relationship to the two children he had with Françoise became heavily strained. Claude and Paloma were both very close to the artist before their mother published her revealing book, and perhaps the portrait was painted with inspiration from Picasso’s own daughter who was then fifteen years old. The girl featured in the painting, may in fact be a portrait of Paloma Picasso. Regardless whom the picture is portraying, it shows the presence and inspiration that he got from the children in his life. 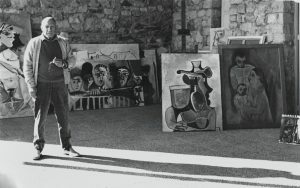 Picasso standing in front of his paintings in his villa in Mougins, 1965. © Photo by Cecil Beaton, Condé Nast Collection, Getty Images. Even during his later years, he remained active and defied old age with a youthful outlook on the world. Many of their close friends agreed that the much younger Jacqueline was the driving force behind his enthusiasm and ceaseless production, together with his love for children and endless curiosity. The children around him and especially his relations began to figure in his paintings from an early stage in his career and with an everlasting enthusiasm he portrayed his sons and daughters in various positions. Most of the paintings from his last years are portraits of either his wife, Jacqueline, or youngsters who he met on the street and painted from memory; often reminding him of himself.